Ask organizations about the potential financial impact of the Internet of Things and you get a fairly even three-way split between saving costs, boosting revenue, and both, according to recent research from technology industry trade association CompTIA. CompTIA’s 2019 Trends in Internet of Things report suggests that organizations can reap both types of benefits if they can manage the complexity and security demands of IoT while building the necessary skills. 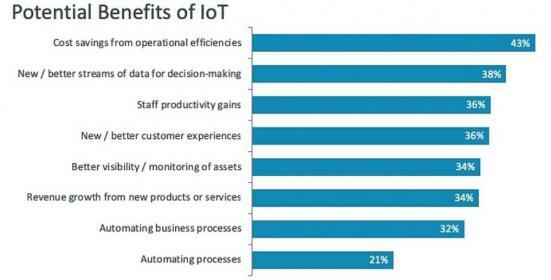 According to the research, 6 in 10 organizations are currently using or experimenting with the IoT. On the cost-saving side, they are looking to become more operationally efficient and productive. On the revenue-generating side, the opportunity lies in offering customers new experiences, products, and services. The research also finds that more SMBs (33 percent) view IoT as primarily revenue-generating than large firms (26 percent). As smaller firms usually have fewer IT resources, the report notes, those are potentially profitable findings for solution providers. 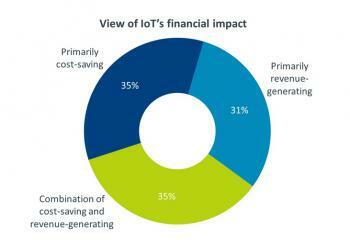 Drilling down deeper into the ROI of IoT, the top potential benefit is cost savings from operational efficiencies, according to 43 percent of respondents, followed by new/better streams of data for decision making, staff productivity gains, new/better customer experiences, and better visibility/monitoring of assets. Determining ROI, however, is moderately difficult or very difficult, according to 58 percent of respondents. Companies are concerned about the cost of IoT projects too, with 43 percent calling up-front expenses a major hurdle, and 34 percent citing ongoing costs as an issue. And those same respondents expect those costs to skyrocket without proper assessment of other risks such as cybersecurity (41 percent), interoperability (25 percent), or handling new data (13 percent). Funding for IoT projects typically comes from outside the IT department, the report notes. The most common source of IoT funding is a new budget allocation, according to 37 percent of respondents, followed by existing discretionary IT budget (26 percent), a combination of budget sources (19 percent), and budget repurposed from cost savings elsewhere (15 percent). Even though the IT team may not be the primary driver from a budgeting standpoint, the report states that there is still a big opportunity for IT pros and solution providers to lead the discussion on how ROI will be determined. "As technology plays a more strategic role for organizations, investments should be evaluated more in terms of a growth mindset, looking at the overall return to the business," says Seth Robinson, senior director for technology analysis at CompTIA, in a press statement.